Here’s a few devos that I’ve done with our team that are great for vision/encouragement during this difficult and exciting time of the fall! Read and discuss II Cor 2:14-3:6 together – this is especially appropriate in the fall as we’re knocking on doors! Who is adequate for such a task? We’re not doing Find Build Send – our job is not to fill a meeting room. Movements are built on lost students coming to Christ and experiencing radical grace. How do you keep going when students never text back? Buoyancy is the ability to bounce back from rejection. Over and over and over. Personal—bad things are happening because I am bad in some way. Pervasive—it’s not just one or two things that are going bad, nothing is going well. Permanent—I don’t think things are going to change. Nothing is going to be any different. So why try? Here are 4 videos you could use to cast vision at a weekly meeting for what students are stepping into when they come to a Cru weekly meeting. Great vision. High energy. Maybe aimed more at leaders (it asks the question – “who will you share the gospel with?”). Not sure if we’ll use this one as it ends on a bit of a downer (Vonette’s death). Good historical perspective of what students are stepping into – we stand on the shoulders of giants. 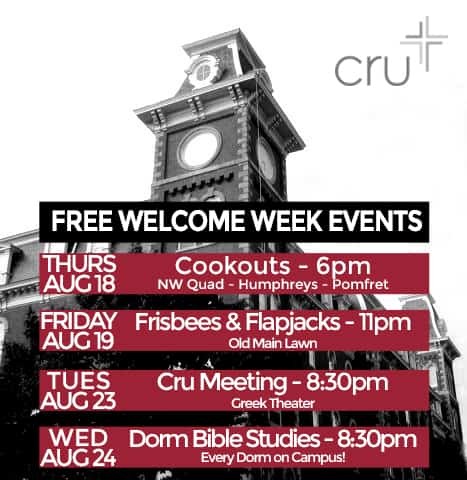 What is community to Cru? This one might be the best of the bunch. No words. 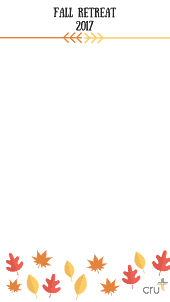 Just a picture of the global community of Cru. This one is super old (probably made in 2011??). We don’t use it anymore. But here it is fwiw. I try to share resources that can be shared by any type of college ministry. Unfortunately these videos will probably only be useful for Cru movements (because of the content/branding)! What other videos do you know of that you’ve showed at a weekly meeting? 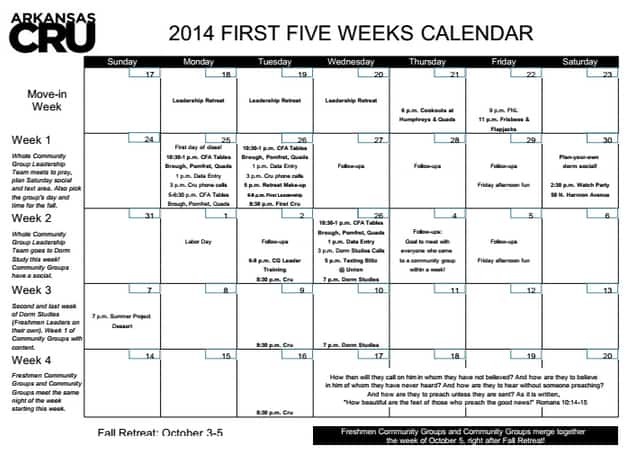 In college ministry, all weeks are NOT created equal. 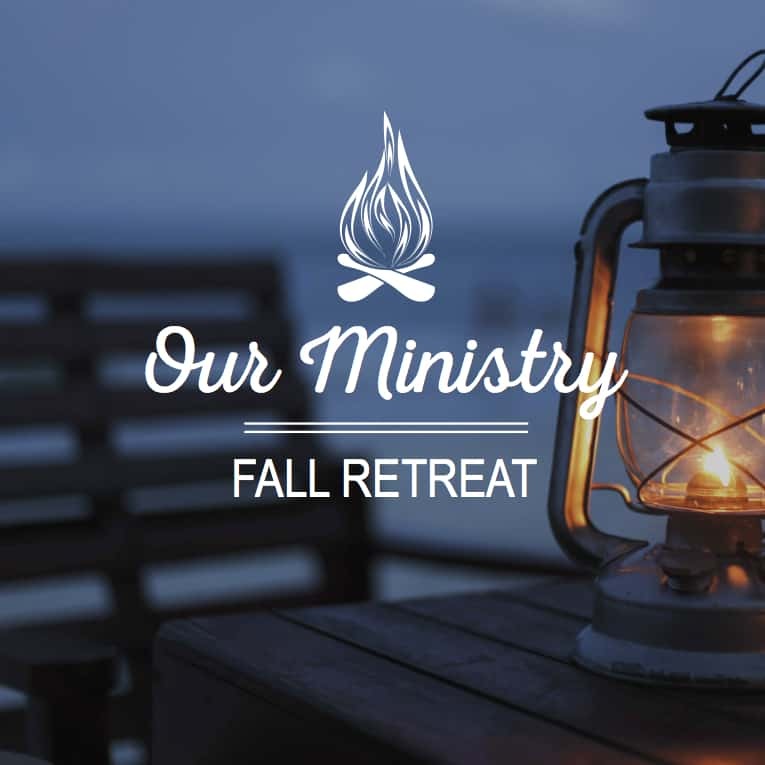 The first 4 weeks of the fall will have repercussions on your ministry for 4 years. From a human perspective, what you do with your team and student leaders in August will determine whether you emerge from the hurricane of the first weeks riding a wave of gospel movement or find yourself completely spent with little to show for it. So what do your staff need to do in August to get ready for the fall (while I focus here specifically on staff, most of this applies to student leaders as well)? The foundation for the whole fall is built on your staff and student leaders walking with God. Our ultimate goal in college ministry = every nation worshipping Jesus. Read the Bible, see His glory, savor Christ, be transformed. Only when this happens will He be proclaimed. Do not assume that your staff are reading their Bibles and walking with God. Do not assume that your student leaders know how to spend time daily with God. Start with the basics. Once students trust Christ, the greatest gift you can give them is a lifetime of reading and being changed by God’s Word. The way you give that gift to your students is by teaching them, in college, how to daily read and submit to God’s Word. This two page article Spending Time Daily in God’s Word is a great way to discuss this foundational first step with your leaders. 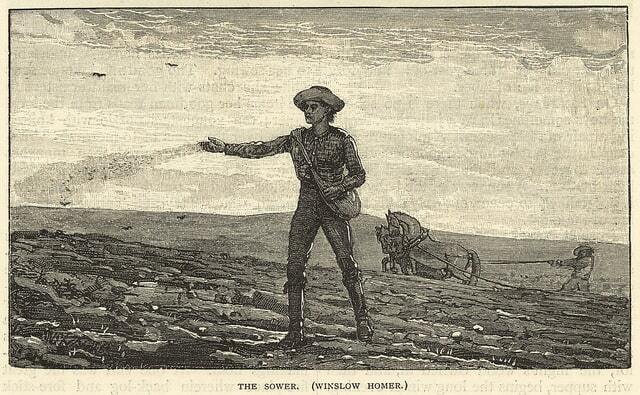 Direction and clarity of role (what) – what does it look like for me/us to succeed? The short of it- success in the first 4 weeks = reaching freshmen by sharing the gospel broadly. Here is a step by step on how to do that. Vision for reaching college students (why) – “You can pretty much assume that most staff return [in the fall] willing and able but not very motivated and with little or no vision.” As Simon Sinek says, I usually begin with this step – the Why. Follow Up Director (getting thousands of contacts and making sure they get followed up). This frees the Team Leader to focus on the team/movement instead of the millions of details associated with the First 4 Weeks. Don’t assume that everyone is on the same page as far as Ministry Philosophy. Communicate clearly on how we do things. We have a one page sheet called “How we do Ministry – One Page” which, as you would expect, tells our entire philosophy of ministry on one page! 2 more days planning 9-noon. Afternoons working on team to-do’s. The Cru design folks have put together some phenomenal stuff at cru.org/fieldops. Best of all, it’s editable (making most of it is usable for non-Cru ministries) and FREE. There’s snapchat filters for things like your weekly meeting and fall retreat. There’s a great guide on how to leverage Social Media in the first 6 weeks. 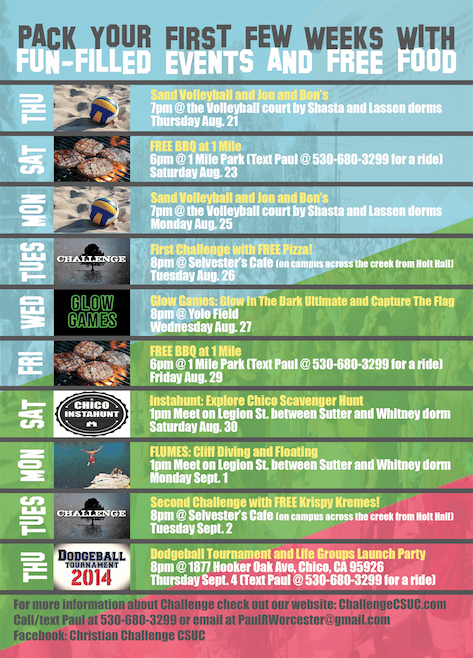 There’s editable fliers for all kinds of first week events. Here’s an all-new 2017 Spotify playlist that we use at all of our freshmen cookouts and our weekly meeting. While cool, upbeat music may be #27 on the list of important things about a Christian meeting, it’s important nonetheless. And what happens when they hear Newsboys or Michael W Smith pumping out of your speakers? You immediately confirm their worst suspicions that you are cheesy and out of touch with their reality. As much as I am not a big fan of hip hop nor dance music, at our weekly meeting we include quite a bit of hip hop/dance. I run the music at our regional winter conference and can conclusively say that hip hop & dance makes a marked difference on the “vibe” of the crowd. It makes your meeting a party. Literally. People dance. Especially if you add beach balls and glow necklaces (we have our first 2 weekly meetings outside – beach balls may be a little less fun indoors). We’ve put a lot of effort into streamlining our Spiritual Interest Survey card. We do it with 3000 freshmen/students the first week of class – so we want it to be quick and effective. Click here to download the editable PDF (open in Photoshop – it’s set up 4/page and it uses “smart objects” so if you edit one flier it changes all 4 fliers). Click for an adapted version we use at a Community College – pdf or Photoshop. And here’s one we use with athletes for AIA – pdf or Photoshop. Our Cru Card that we use for our weekly meeting is similar but a bit different from the survey. You can download the editable PDF (open in Photoshop – it’s set up 4/page and it uses “smart objects” so if you edit one flier it changes all 4 fliers) file here. Nothing special. But I always think it’s fun to see what other campuses do for promo. Here’s the editable PDF for the first (open in Photoshop – it’s set up 4/page and it uses “smart objects” so if you edit one flier it changes all 4 fliers). And the Photoshop file for the color version. 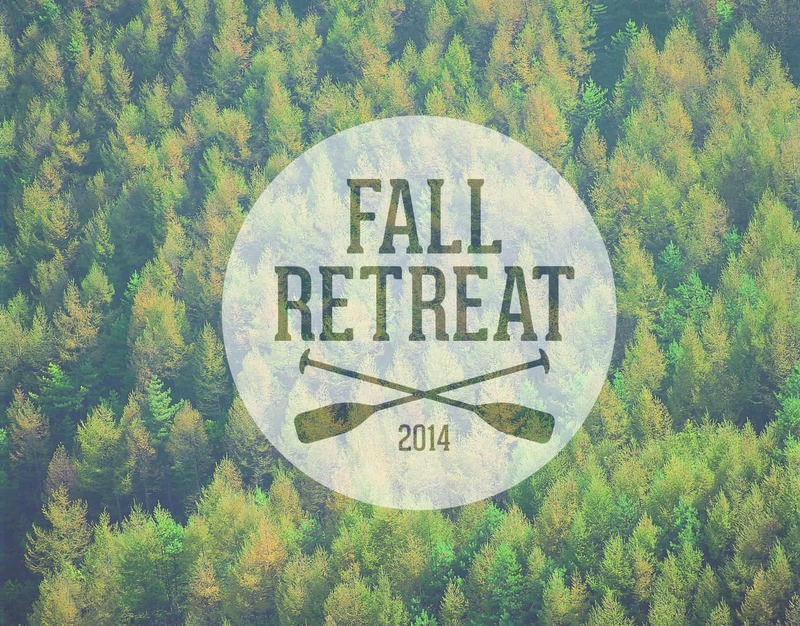 If you don’t like any of the aforementioned Fall Retreat designs, here’s some other designs we have used before. 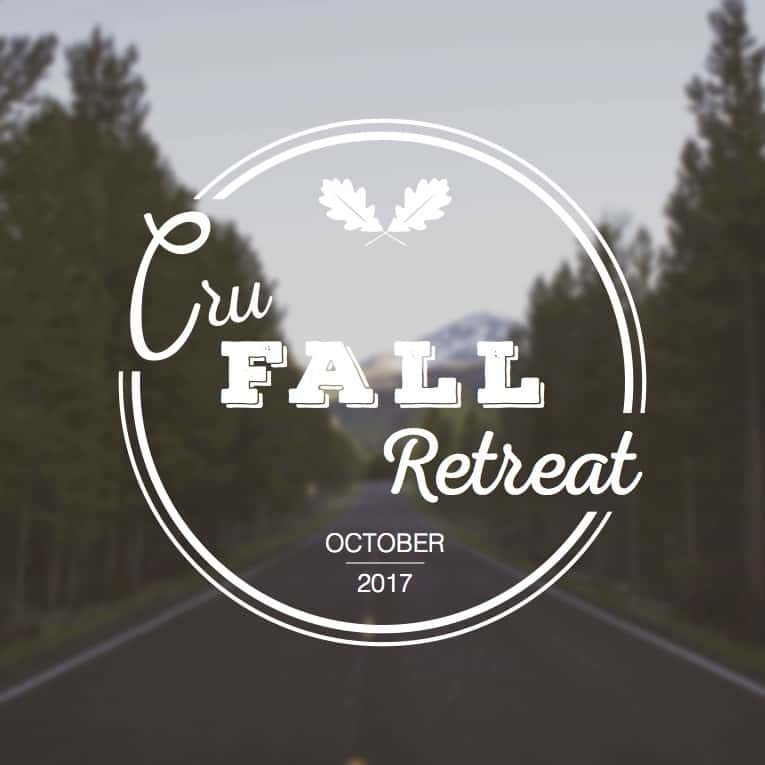 Here’s our 2016 Fall Retreat brochure (designed by Cru designer Jamie Wang). Besides the basic flier that you can edit and make your own, Jamie has a folder full of goodies: Facebook profile pics, slides, etc. For Printing Flyers: You should be able to fit four of the flyers on an 8.5 x 11″ page. Tell FedEx it has a 1/8″ bleed. Here’s our 2015 brochure (designed by Cru designer Libby Slaughter). And here’s the photoshop files so you can edit it and use it! All this stuff is from Jamie Wang that she has graciously made available to all – to edit and make your own. 1. 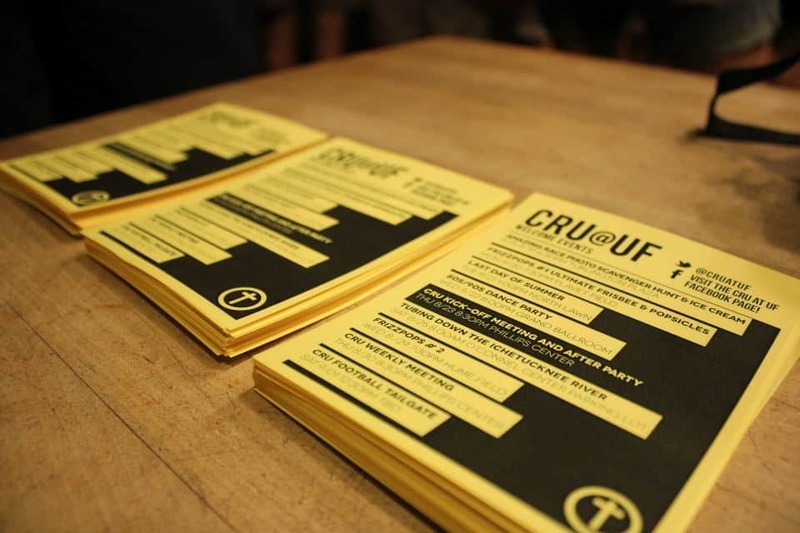 Cru Campus Magnet -I made this for Arkansas last year. This was a gift to their campus supporters. 4. Cru Photos -to use in promo pieces for your campus or prayer letters, etc. 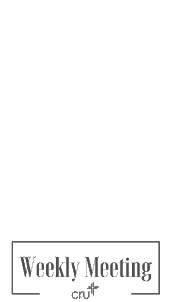 -Great if you need some help kickstarting your newsletters!